Black Hills Honey Badger line of ammo features copper solid bullets manufactured by Lehigh Defense that work through fluid transfer mechanics rather than a traditional expanding hollowpoint. Lehigh Defense is a small ammunition company that thinks outside the box, and its unique approach to projectiles has gotten it a lot of attention—as much from other ammunition makers as the general public. The company’s Xtreme Penetrator bullets caught the attention of Jeff Hoffman, president of Black Hills Ammunition, a company that has its own reputation for challenging preconceived notions on ammunition and for recognizing the potential in other firms’ bullets. 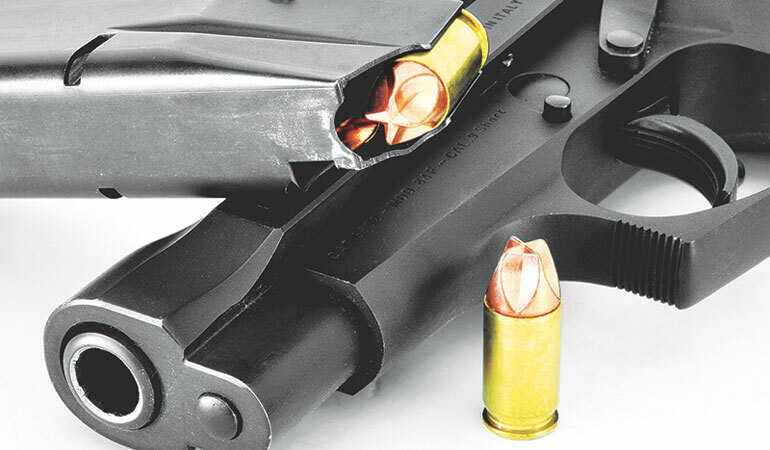 Working with Lehigh, Black Hills helped design a new version of the Xtreme Penetrator specifically for a line of pistol ammo that ultimately was called Honey Badger. If you’re wondering where the name comes from, Black Hills borrowed this licensed name from AAC, which produces a gun by that name. Do yourself a favor and search for a video titled “The Crazy Nastyass Honey Badger.” You’ll thank me. Honey Badger don’t care, which is the point of these bullets. They are designed to not care what they have to punch through to get to the target, whether it’s thick clothing or drywall. Because their performance is not dependent upon expansion, and they have homogeneous construction, their ability to penetrate intermediate barriers tends to be superior to that of traditional hollowpoints. These are CNC-machined copper solid bullets and generally light for caliber. You will see crossbars on the front of the bullets, either with flats or sharp edges, depending on caliber. Between those crossbars, down the body of the bullet, are flutes. To understand the terminal ballistic performance of a bullet like this, you need to remember that humans are little more than big bags of water. Upon impact with a bad guy, the edges of the crossbars on the bullet nose cut through clothing and skin, and then the flutes behind those crossbars redirect the watery tissue radially as the bullet penetrates. In simpler terms, the edges cut in and the curves on the body of the bullet shove the tissue out of the way with such force that it usually provides equal hydrostatic shock/temporary wound cavity to a traditional hollowpoint, if not more. It is for this reason that Lehigh calls these types of projectiles FTM—Fluid Transfer Monolithic—bullets. Lehigh’s goal was an 18-inch penetration-depth range achieved by “progressive nose geometry.” Those radial flutes force the hydraulic energy inward to build pressure, and Lehigh claims that the fluid transfer dynamics result in a permanent wound cavity twice the size of any expanding bullet. Black Hills initial Honey Badger loads focused on handgun calibers whose hollowpoint performance was often hampered by a lack of velocity—either by limitations of the cartridge itself or the fact that it was often chambered in short-barreled guns that produce low velocity, which hampered expansion of traditional hollowpoints. The first Honey Badgers included a 100-grain .38 Special load and a 60-grain .380 ACP load. It has since greatly expanded to eight loads in nine different calibers, but let’s look at the original two first. The .38 Special +P load features a 100-grain bullet. Out of the standard 1.875-inch snubbie barrel, it will do about 1,000 fps. In gel tests this bullet penetrated 14.75 inches and created a 6x3-inch temporary cavity. The .380 ACP load features a 60-grain bullet and will do close to 1,100 fps out of most carry-size guns. That is no exaggeration. I tested it in a Taurus Spectrum last month, and out of the Spectrum’s 2.8-inch barrel, this ammo did 1,104 fps while having less felt recoil than a standard .380 load. I feel so strongly about this ammunition that it’s what I keep loaded in my Beretta 84F kitchen cupboard gun. In gel tests this little bullet penetrated more than 10.5 inches while creating a 6.5x2.5-inch temporary cavity. And once again, because of the design of the bullet, it will not clog up or break apart going through clothing or light barriers and does not require a minimum velocity to expand as it works without expansion. Note that these are not “one size fits all” bullets. You’ll see a huge difference in shape and design between, say, the 135-grain .45 ACP Honey Badger bullet and the 60-grain .380 ACP bullet, even though they have similar proportions. 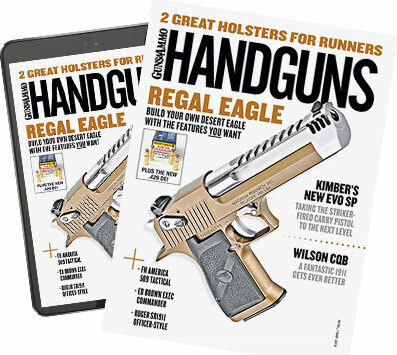 The 135-grain .45 ACP Honey Badger load is advertised as doing 1,325 fps out of a handgun. Last year I bought a CMMG Guard pistol, which is an AR-15 chambered in .45 ACP. Out of the Guard’s eight-inch barrel, the Honey Badger ammo does just shy of 1,600 fps and is my favorite defensive load for this gun. Penetration is never an issue with a Honey Badger bullet. The issue is making sure the bullet doesn’t overpenetrate, so Black Hills and Lehigh Defense have had to adjust crossbar thickness and flute geometry individually for each caliber to produce the proper depth of penetration. Black Hills now offers two 9mm loads in the Honey Badger line, the original 125-grain bullet deliberately loaded to subsonic velocity (1,050 fps) and a new 100-grain load advertised to do 1,300 fps. The subsonic load could be compared to competitors’ light-recoiling rounds meant for small guns or recoil-sensitive shooters. Out of the 4.01-inch barrel of my Glock 19, it gave me 964 fps and relatively soft recoil. In the bare block this bullet penetrated 157/8 inches and stopped base forward. Through drywall the Black Hills Honey Badger penetrated 11.5 inches and again came to rest with the base forward. The recovered bullet had a bit of drywall dust inside the flutes but was undamaged and weighed 125.7 grains, showing it shed no weight whatsoever. Fired through the plywood, the Honey Badger showered the range in splinters, and I noticed a lot of them were stuck in the front of the ballistic block. After piercing the plywood, the bullet penetrated 9.5 inches into the block, coming to rest nose forward. The sheet steel test proved interesting. After punching through the two layers of steel the 125-grain Honey Badger penetrated the ballistic block 10 inches and came to rest nose forward. Examination of the recovered bullet showed that the sharp flats on the front of the bullet were no longer sharp or flat after passing through two pieces of sheet steel. However, recovered weight of the bullet was 125.3 grains, so it lost no weight in transit. The Black Hills Honey Badger line of ammo is something seriously different. I highly recommend you check it out.